Still fruit juice drink with botanical extracts. Contains only naturally occurring sugars. No colours or preservatives. Vegan-friendly. 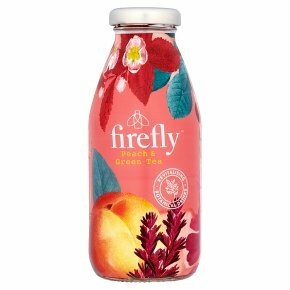 A perfect peachy pick-me up, positively enlivened with green tea and kola nut. Pour over crushed ice and a slice of fresh peach for a virgin cocktail, or make it sing with a drop of gin. Either way it's eye-opening stuff. Shake well. Serve chilled and drink within 24 hours of opening.